A simple to make broccoli soup finished with creamy stilton. 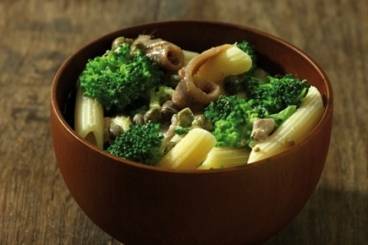 An easy pasta dish with broccoli capers, anchovies and a dash of creamy sauce. Broccoli is the unfortunate under dog of the cabbage family. and yet, it is THE most nutritious vegetable around: it surpasses kale by a long shot on the health benefit aspect, and it is recognised as an ally in the fight against cancer. This salad is not only wonderful, it will redeem humble broccoli in the eyes of many. Slices of beef steak stir fried with broccoli and red onion served on a bed of spaghetti with gorgonzola sauce. Blanched florets of cauliflower and broccoli dressed with a cheddar and gruyère sauce before being topped with Parmesan and baked until golden brown. Serve as a side with your roast dinners. Salmon fillet cooked in honey glaze and served with stir-fried broccoli, soba noodles and soy sauce. Sliced chicken breast cooked in a wok with broccoli, red onion and sesame oil.